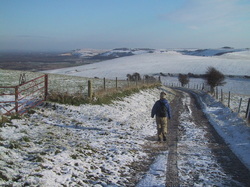 My sabbatical project during the 2002-3 academic year, aside from the usual research, was to walk the South Downs Way. The host institution for my sabbatical leave was the University of Sussex, but we chose to live in Hove in a newly renovated Victorian flat near the sea—convenient, pretty, and, well, pricey. I walked the South Downs Way in bits and pieces from October 2002 through February 2003, mostly on Saturdays. Sometimes my wife Ellen accompanied me, but most often I walked alone. This series of day trips relied almost exclusively on the wonderful public transportation systems of Sussex and Hampshire. I only took a taxi once, and accepted only one ride as a passenger in a car to or from the trailhead. My reliance on public transportation meant that I had to plan carefully to ensure that I could get to and from the trailheads. The National Trail Guide for the South Downs Way was extremely helpful for its trail descriptions and detailed maps, but I also had to master the bus and rail websites—supplemented with paper schedules and verbal queries—to figure out my routes and connections. By the end of my adventure, the trail guide was covered in little yellow sticky notes containing bus and train schedule data. A typical hiking day started with me catching a train or bus at about 7 am, getting to the trailhead an hour or two later, and completing the day’s walk by 3-4 pm. Most of the time I carried lunch that I ate on the trail. I frequently stopped for a pint and an early supper near wherever I had finished walking before finally catching the bus or train home, usually arriving before 9 pm. This all took place during the autumn and winter seasons when days were short, so getting off the Downs before dark was a high priority. I highly recommend this 100 mile walk. It was relatively easy going most of the time, with good paths, often on chalk that doesn’t get very muddy, and with mostly clear trail markings. I wore low, light walking shoes and dressed in layers, inevitably peeling down to just a shirt once warmed up, except in deepest winter. It rained often enough to mandate a good waterproof and hat, and the wind blew constantly. Most of the time the views were stupendous, typically including the sweep of the downs, the dramatic drop of the escarpment, the checkerboard of farmland in the Weald, the periodic smudge of a city, and the blue ocean hugging the horizon. This ancient path had innumerable archeological treasures, so that any given segment was likely to offer one or more Neolithic barrows, Bronze Age earthworks, Iron Age fortifications, Roman tumuli, Saxon or Norman churches, Victorian follies, World War II fortifications, and (unfortunately) modern telecom towers. In what follows I offer my impressions of the various trail segments in east-to-west order from Eastbourne to Winchester. Since I did not walk the segments in this strict order, my narrative, like that of Kurt Vonnegut’s hero in Slaughterhouse Five, sometimes becomes “unstuck in time.” Please forgive me for this, but I suspect that a geographical rather chronological ordering will be more useful for readers. Note, however, that I sometimes compounded the problem by walking west-to-east on a particular segment. But I typically did so for a very good reason, as my notes on the first trail segment will illustrate. Walked in reverse from Exceat to EastbourneEllen and I got up reasonably early and saw that the day was lightly overcast and very windy, blowing from west to east. We decided to walk with the wind at our backs instead of slavishly following the trail guide that goes from east to west. We took the special Sunday bus from Brighton to Exceat where the Seven Sisters Country Park begins. We hopped off and made our way along the contours above the winding and very beautiful Cuckmere River down toward the sea. We were treated to the spectacle of modern sheep-herding, involving two dogs and a Land Rover. There was a steep climb up to the first of the Seven Sisters, beautiful chalk downs that fall dramatically into the sea. The wind was so strong that we were literally blown down the far side of each Sister and up the near side of the next—it was hard to stand upright in this gale—so we made record time to Birling Gap. Along the way, we encountered scores of marathoners running the opposite direction, directly into the wind. Poor sods, it had to have been the slowest marathon on record! From Birling Gap, which had minimal facilities, we made the long, slow ascent to Beachy Head, where we stopped at the tourist pub for lunch. Mediocre food, prepackaged atmosphere, but at least we were out of the wind. We noticed that the Coast Guards had set up a pulley-and-hoist system over the cliff’s edge, when asked they said that some poor woman had purposely driven over the edge and they were retrieving her body and her car. But I have to say that I actually like the fact that there are no guard rails along the cliff’s edge—it assumes that people are responsible for themselves. U.S. park planners are so scared of lawsuits that they close off all of the interesting places. Anyway, we slowly descended to Eastbourne, first tripping down a steep set of switchbacks and then enjoying a leisurely walk through level meadows. There was a good mile or more of walking on the streets of Eastbourne to get to the bus station for the sleepy trip back to Brighton. The next day we read in the newspaper that the day’s weather had been disastrous for Sussex, knocking down trees and power lines, and that our “windy day” had officially been a Force 10 gale. The bridle path between Eastbourne and Alfriston goes inland instead of hugging the coast, and I walked that segment to see how it compared with Beachy Head and the Seven Sisters. This time the bus schedule dictated that I walk west to east. Getting to the charming tourist village of Alfriston required me to take a train to Lewes and then a local bus. I left town on a footbridge over the Cuckmere, went up a hill past the smallest church in Sussex, and soon I found myself traversing the downs just above the head of the ancient Long Man of Alfriston. This androgenous, football field-sized cutting on the side of the chalk down could just as easily be a woman, from what I could see, but it was still a cool site. The path continued past tumuli and barrows before taking a quick dip down into Jevington and its pretty Norman church. After a climb back up, it then hugged the edge of the escarpment until losing itself within the Eastbourne street grid, where I arrived just at sunset. Exceat-Southease 10.1 miles10 November 2002I got a late start on this segment and ran into trouble as a result. It was a dreary day, with low clouds and mist, when I got off the bus at Exceat. The trail wound up through woods, bisected the old village of Westdean, re-entered woods, and eventually popped out onto the downs on a traverse above the Cuckmere River. At Litlington, the trail dropped down to parallel the river up to Alfriston. In Alfriston I stopped for some delicious, warm food at a shop because the pubs were closed. The weather switched from mist to rain, and I foolishly kept going. I climbed back up onto the downs hoping to see a long barrow, an ancient cross dyke, Firle Beacon, and a bunch of tumuli. Instead, I saw nothing. The weather closed in, so I could only see a dozen yards in front of me, and because it was late autumn it soon (4 pm) began getting dark, eventually so dark that I couldn’t even see my hand in front of my face. Luckily, the path along the top of the downs was flat so I didn’t have to worry about falling over any cliffs. But I was not at all sure where I was or how far I had to go before encountering the extremely steep descent off Idford Hill to Southease. Suddenly, out of the dark came a dog, a houndish type that made me think of the Hound of the Baskervilles. But this one was a welcome sight, and friendly to boot. I turned in the direction he had come from, and soon I met a couple holding two leashes but only one dog. They asked if I had seen their animal, and once the dog returned from his romp, they kindly led me off the down to their car near Firle Beacon and drove me all of the way back to Hove. There I ate a humiliated dinner at home, having been beaten by the downs. Some weeks later, Ellen and I re-walked the segment in reverse and we had a lovely time. It was partly cloudy and quite cold when we got off the train at Southease. Ellen wore a hat and kept her hood up the whole way. Our first task was to leave the Ouse River valley and climb up Idford Hill onto the escarpment of the downs. We had wonderful sight lines across the valley to Lewes and along the downs to Firle Beacon and the nearby radio masts. The tumuli and barrows that I had missed in the mist and dark were easily visible and quite interesting. There were also dew ponds and plenty of sheep, but no dogs. After a long and inspiring walk along the ridge line, we descended into Alfriston in time for tea. The only place that was open was a ‘forties paraphernalia shop that also served tea, perfunctorily, but at least it warmed us up. Upon discovering that the bus wouldn’t come for another hour and a half, we repaired to the Star Inn for a wonderful pint and hot dish. It turned out that the proprietor had lived for 20 years quite near us in New Jersey, so we reminisced while sitting by a cozy fire, all three of us glad to be in Alfriston that evening. This short segment started at Southease station, a stop in the middle of nowhere that remarkably has regular rail service to Brighton and beyond. I had a pretty clear day to work with, so I took my time. The first stop was on the other side of the extremely tame Ouse River at the lovely Saxon church in tiny Southease. Its round tower and old wall paintings were fascinating. Some months later I went back for another visit and found myself sitting in a pew sharing a bottle of Pinot Grigio with the church wardens who had just spent a day fixing up the building. Anyway, after the church it was time to climb back up onto the escarpment where fine views of the fortified town of Lewes followed me on the right for several miles. Eventually it was time to drop down to the A27. There I left the South Downs Way and walked along the noisy highway for two miles until I reached Falmer rail station and the train back to Hove. Before boarding the train I stopped for a pint of Harvey’s (the very nice local brew) at the Swan, the first non-smoking pub I had ever encountered. May others follow in their wake. Ellen accompanied me on this segment. Things started inauspiciously, because as soon as we got off the bus at Housedean Farm on the A27 it started to rain. We didn’t have full rain gear, and we wound up ineffectually wearing garbage bags to try to keep dry. The beginning was an uphill slog through woods and across inhabited fields. Eventually, the rain diminished and we reached the edge of the escarpment. We took a quick walk up to Black Cap, the highest point, and then we parted ways temporarily. I walked all of the way down into the Weald to the wonderful Half Moon pub in Plumpton for a pint and a delicious, family style hot meal, whereas Ellen stayed on top of the escarpment and slowly slogged toward Ditchling Beacon. After lunch I climbed back up onto the downs and met Ellen some miles later in the Ditchling Beacon car park. Eventually a bus came and rescued us from the rain. The Half Moon was well worth the fairly strenuous diversion, in my opinion. This extremely short segment was done on another rainy day just to get it over with. The bus schedule dictated that it be done in reverse. It involved not much more than a quick bus ride up to Pyecombe, which is a tiny, beautiful village ruined by the A23, then a quick climb onto the escarpment, and then a jog of a few miles over to Ditchling Beacon. There I begged a cup of tea from the ice cream truck and waited for the bus. Who but the British would expect to be able to sell ice cream in mid-December in the cold rain on top of a windy hill? The prevailing wind and the bus schedule conspired to make us walk this segment in reverse too. Snow had fallen the night before and the downs were white. The sky was a brilliant blue but the wind was strong and cold enough that we kept hats and hoods firmly tied on. Ellen and I took the bus up the Adur River to its intersection with the South Downs Way above Upper Beeding. There, we disembarked and headed straight up Beeding Hill on a well used bridle path. We saw lots of farm animals looking anxiously for forage and we passed a shuttered youth hostel. Eventually the path led us through an Iron Age earthen fort to Devil’s Dyke, where we had a wonderfully warm, albeit not very tasty lunch. Children were making the most of the snow, buildings snowmen, throwing snowballs, and sliding. Then we continued around the dyke and down through a sunken lane to little Saddlescombe, where the South Downs Way passes a farmhouse with a wonderful garden and all sorts of chickens, ducks and geese. A final climb over West Hill brought us to Pyecombe and the Plough, which served a wonderful early dinner before our bus home. This was a fine walk on an overcast but clear December day with shafts of sunlight shining through the clouds. It looked like an advertisement for life insurance. The first stop after getting off the bus and crossing the river was St. Botolph’s, a beautiful little Saxon church all on its own in the river valley. I suppose the town that used to surround it withered away. Then I climbed up onto the escarpment and walked northwest, passing the deep bowl of Steyning to the right, and stopping to eat my sandwich atop Chanctonbury Ring, which dominates the skyline for miles around. The views down into the Weald were spectacular. Soon enough, I was headed down the hill, past cattle, then sheep, to Washington and the Frankland Arms which served a sound pint of Harvey’s and a wonderful hot meal. Eventually a bus came and took me home. Walked in reverse from Amberley to WashingtonThe wind direction and the bus schedule led me to walk this segment in reverse. A very nice thing about Amberley was that it had a train station with regular service, not to mention a pub and an inn. This segment was not particularly inspiring for walking, however, consisting of a climb through a working farm onto the downs, a walk through a very open landscape that is either actively tilled or used for pasturing cattle and sheep, followed by a descent through another working farm to the bus that took me home. The only highlights were some dew ponds and a beautiful view of a flooded Arun River valley. After de-training in Amberley, I made my way across the meandering Arun River on a series of dykes and bridges. After Houghton, the trail went straight up a steep open hillside, skirted some farms and a heavy wood, and then followed the contours of several hills, ducking in and out of woods. The scenery was more varied than it had been on the open downs. An especially exciting moment was when the South Downs Way crossed Stane Street, the old Roman road connecting Chichester and London. Latin fingerposts drove home the point that this quiet wooded spot was once an important crossroads. The path continued to duck in and out of woods atop the downs until it began a slow descent into woods that eventually led to the village of Cocking, visible only by glimpses of its Norman church until I was actually in the valley with it. Although there was a nice pub in Cocking, I had to take the first bus out because otherwise I would have been stranded. But dinner in Chichester was just fine. This was one of my favorite segments, offering a varied landscape and some fascinating archeology. It was a misty day, but that just added to the sense of mystery and awe. Taking first a train, then a bus, I arrived reasonably early in Cocking. Then I climbed straight up a hill onto the downs, which hereabouts were heavily wooded on the sides while still being bare on top. Much of the trail went through cropland, although there was also plenty of pastureland. A wonderful moment came just after passing through the woods above Monkton House, where the path turned sharply south and the Devil’s Jumps appeared out of the mist. These Bronze Age burial mounds were in very good shape and appeared to be well protected. Not too long after that, the woods gave way to open hillsides where a series of crossdykes and an iron age fort made their appearance. The weather cleared. A series of farms, woods, and meadows lined the trail, and soon I crossed the border from Sussex into Hampshire. After that there was a fairly rapid descent into Buriton. Unfortunately, even though the train line passed right through Buriton, it lacked service so I had to hoof it an extra two miles into Petersfield to get home. As compensation, however, Petersfield had a beautiful old center and there was a superb tea shop nestled into mews next to the church. Having learned my lesson about Buriton’s inaccessibility, I took the train to Petersfield and then a cab to Buriton to begin this segment of the walk. I started in the morning mist walking through the solemn woods in Queen Elizabeth Country Park. Eventually the Way crossed the busy A3, broke free of the forest, and followed the hedgerows to the HMS Mercury naval station. It continued through rolling hills, woods, and farms for some miles. Just below the Iron Age fort on Old Winchester Hill, I heard a sudden horn call and galloping hooves, saw a flurry of red, and then the local hunt went charging by me, splattering me all over with mud in the process. I heard that hunting was outlawed shortly thereafter, which seemed to me to be a fitting punishment. The farm lane down from Old Winchester Hill to Exton was pretty but it got wetter and wetter. To discourage walkers from leaving the path, there were signs warning of unexploded World War II ordnance littering the hillside nearby. Eventually the farm lane turned into a river and I had to jump from hummock to hummock to try to stay dry. Exton itself was cut off by the flood so I caught a bus directly back to Petersfield. The final segment of the South Downs Way went through country that got progressively tamer, flatter, and more built up. It was a beautiful, clear, cold day, with a perfectly blue sky and blinding sunshine. The waters had receded from Exton so it was an easy walk from the bus stop through town, past the Shoe and the lovely church. Then the path went up the hill skirting several farms and mostly following farm lanes. I had a delicious lunch and a pint (no Harvey’s in Hampshire, however) at Milbury’s Inn before following the temporary routing of the South Downs Way through a set of country lanes. The lanes eventually took me through the middle of Chilcomb Manor before dumping me unceremoniously onto a pedestrian overpass spanning the M3. From there it was a short hike into the middle of Winchester. I visited the Cathedral, enjoyed a nice cup of tea, and caught the train back to Hove, tired but very happy.